Since being married, I've been learning to cook out of necessity. Neither I nor Woody are naturally drawn to kitchen life, but we gotta eat, so we cook. I'm starting to enjoy it, but I still have a lot to learn. 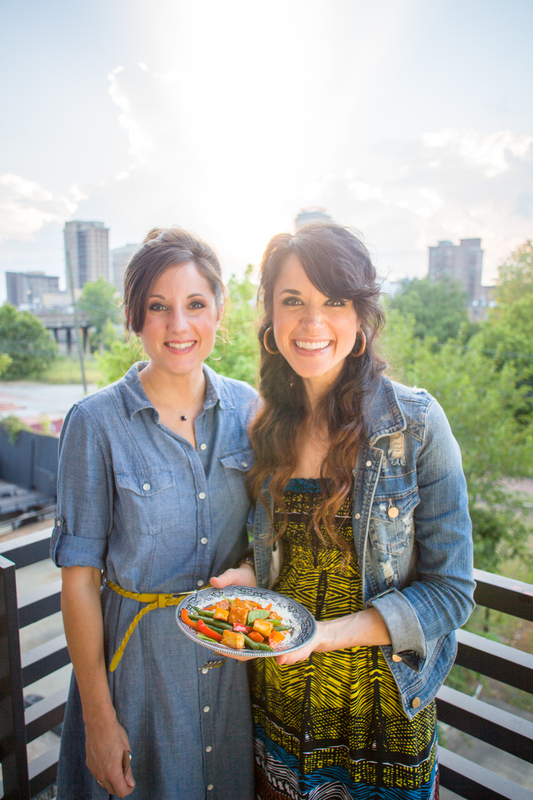 I know I'm not the only gal who has done more cooking in her newlywed years than all the rest combined, so I asked my talented friend and food blogger, Callie of Luv Cooks, to be a guest on the tlk blog! 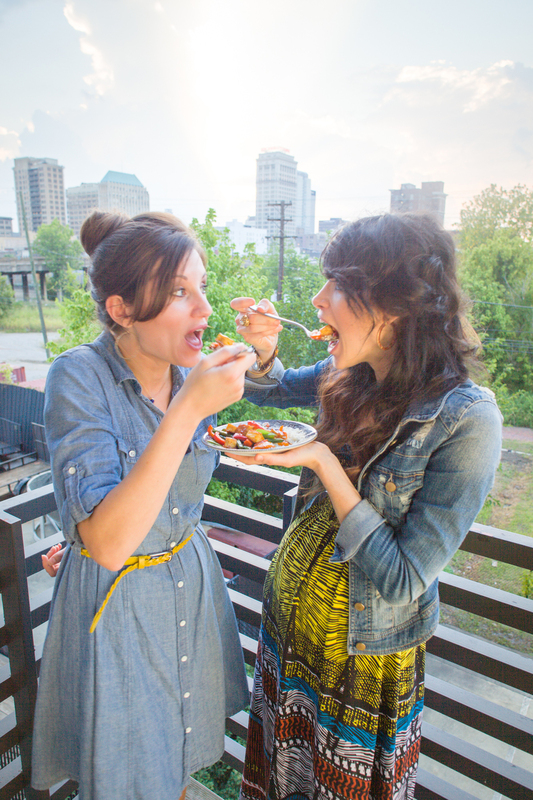 She will be joining us for a series of four posts featuring great recipes for newlyweds (or longtime-weds!) and essential tools for every kitchen. 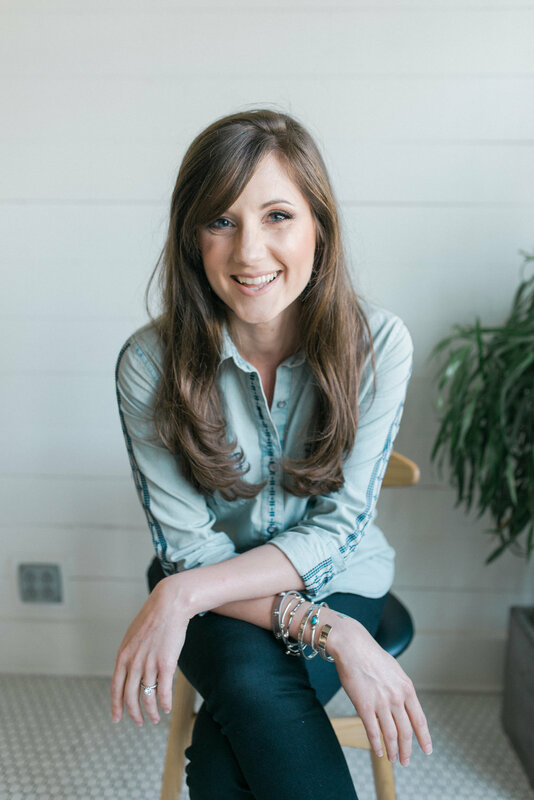 In between posts make sure to check out all the other fabulous goodness on Callie's blog. Her recipes are sure to delight, and you'll be encouraged by her sincere heart for treating people with Southern hospitality and grace in and out of the kitchen! I will also be guest blogging on Luv Cooks and you can read my opening post here! Without further ado, here's Callie! I once read that every great chef needs a great knife. Outside of being a solid kitchen motto, a great chef's knife is a home cook’s best weapon, literally and figuratively*. It makes cooking easier, dicing safer, and generally qualifies you as all-around impressive to your husband, friends, and family. Or, as we say in the South, you will have earned official "cookin' braggin’ rites" in one fell swoop-or should I say slice? A great chef's knife is not hard to find. I am not a knives expert, but with some research, I know that you can find your ideal match. This article from Serious Eats has great how-to’s on finding the best chef's knife for you. A great knife is sharp. No matter what, sharpen your knife! A dull knife causes more injuries than a sharp one. I like these style sharpeners, but you can also use a steel. A great knife makes kitchen prep easy. 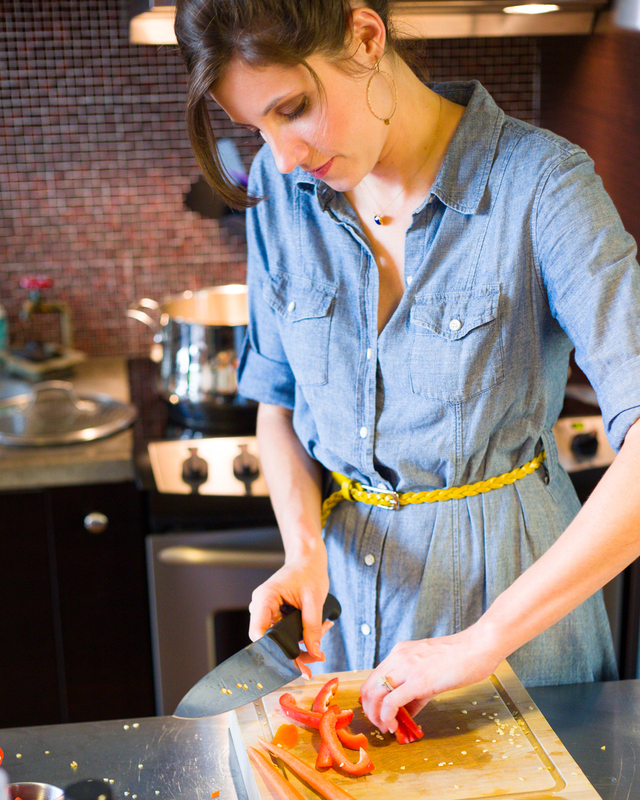 To slice most efficiently, use a back and forth motion with your knife. With the knife point’s pressure on your cutting board, rock the knife back towards you and the item you are cutting. Use the same continuous motion to slice/chop/dice as needed. A great knife is safe. Going back to point number one, your ideal knife will feel comfortable and steady in your hand. Also, guard your fingers! Using a sharp knife is great, but you want to be careful you don’t slice those precious cooking fingers. As you slice, guard the fingers on your opposite hand by curling your upper fingers under your knuckles or by keeping them at a 90-degree angle. 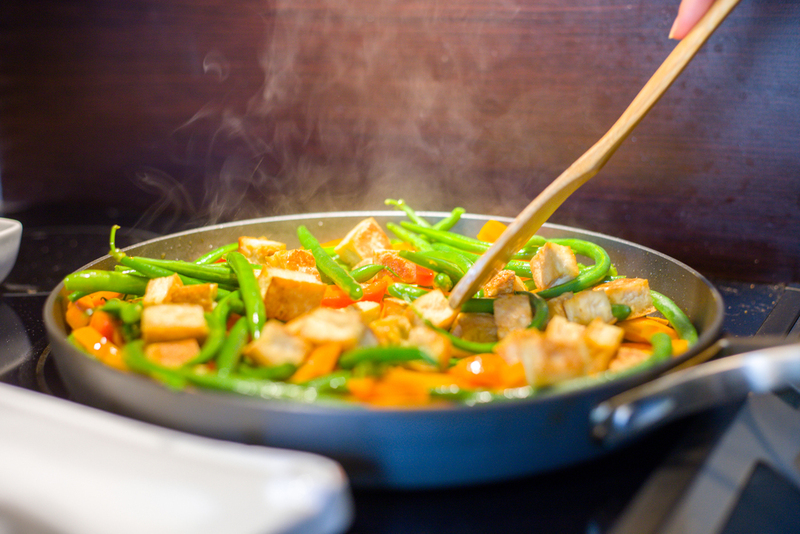 This stir-fry tofu recipe is a great one to showcase a knife for many reasons. First- it’s simple and veggie-friendly. Tofu is easy to cook, full of protein and, let’s be honest, inexpensive. Red and yellow bell peppers add a floral, fruity sweetness to the green beans in this dish, and chopping up those suckers with a fabulous kitchen tool just makes the experience all the more fun. Third, the sauce is delicious and I almost 100% promise that if you have tried tofu before and weren’t a fan, this will convert you. The way the tofu is prepped ensures it's crispy and chewy, giving it a meatier texture, and the results are spicy, sweet, and full of Asian flavors. *Also, it should be noted that chopping is an excellent way to relieve stress and aggression. Bad day? In a disagreement? Bust out your knife, a carrot, and a cutting board and get to choppin'. Recipe adapted from The Minimalist Baker, a fantastic husband-and-wife food blog. Preheat oven to 400 degrees and begin drying your tofu. Remove it from the package, drain, and place it between two thick towels folded into the shape of the tofu. Then place it on a paper-towel lined plate or bowl and top it with something heavy like an iron skillet. Let it dry for about 15 minutes, changing your towels if they get too wet. Once dry, chop the tofu (with your awesome knife) into roughly 1-inch cubes or rectangles, whichever your heart desires. Spray a cookie sheet with cooking spray, and arrange chopped tofu on the pan. Bake for 15 minutes, flip over your tofu cubes to ensure even color, then bake for 15 more minutes. This will dry out the tofu and give it a more meat-like texture. Once the tofu is golden brown and a bit tough and firm, remove it from the oven and set it out to dry a bit more while you prep your vegetables. Ideally, it would set out another 45 minutes or maybe longer. I don't recommend refrigerating it overnight; I tried this with Mattye and let's just say it was cheeewwyyy. If serving over rice, start the rice at this point. I love Uncle Ben's instant rice. 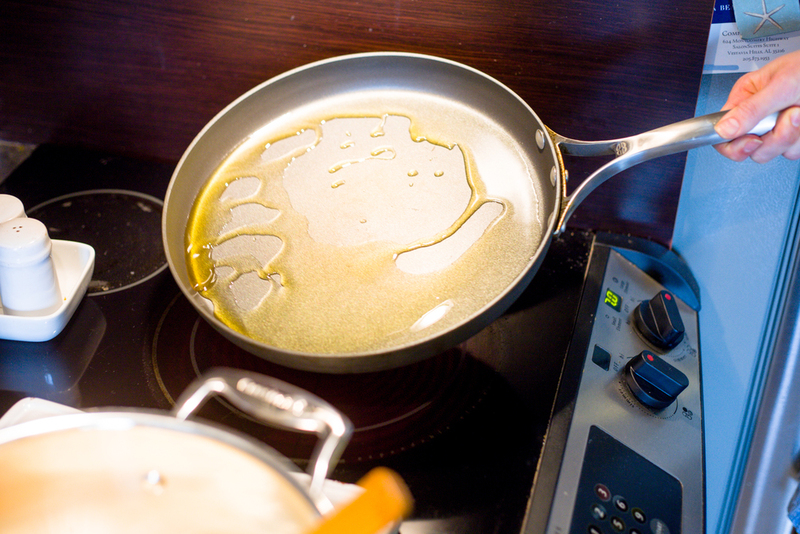 Heat a large skillet over medium-high heat, add oil and swirl to coat the bottom of your pan. Then add (your beautifully chopped) veggies and toss to coat. Cook for 5-7 minutes, stirring often. When the vegetables have some color and have softened a bit (just feel them with your spoon or spatula; they should have some give to them), add the sauce, and stir. It should bubble and thicken. Then add the tofu and stir to coat. Cook the mixture for 3-5 minutes, stirring often. Try your best to not overcook this; taste it every minute or so to make sure your veggies stay on the crisp side. When veggies are cooked to your preferred doneness, remove from heat. Serve your stir fry as is or over rice for a more filling meal. Enjoy and revel in your delicious, knife-wielding success. Bravo!